TV’s news comedy show, Mock the Week, has a semi-regular and very funny segment involving Hugh Dennis and one of the other panelists. In this segment, the other panelist will read lines from a senior political figure while Hugh Dennis delivers his interpretation of what the politician really means. I had the same feeling this morning as I watched David Cameron’s much-trailed speech on the EU. BBC News showed the speech in full, and afterward commentators made much of the obvious and very unsurprising points of the speech, namely that the speech was Cameron’s (rather desperate) attempt to defuse the threat from UKIP and his own backbenchers and to persuade europhobic voters to support him in the next general election by dangling the promise of an ‘in/out’ referendum in 2017. Some also highlighted the obvious fact that by cravenly giving a 2017 date for the referendum, he was condemning the British economy to up to 5 years of uncertainty – a potentially crippling blow (on top of so many others) to any chances of economic recovery. However, by focusing on the blindingly obvious points, the media (at least all the media that I have seen/heard) missed the most revealing points of Cameron’s speech. Everyone knows that a large section of Cameron’s backbenches is rabidly anti-Europe, and that he’s terrified of the threat to the Tories’ electoral chances posed by UKIP splitting the right-wing vote, and the parts of his speech that addressed that were embarrassingly transparent. But there was a different and more sinister leitmotif – a theme repeated to the point of nausea – in the speech, and it was there that I kept having Mock the Week flashbacks. HD: So I want you to believe one thing while I mean another – the EU is hampering our plan to make my mates and me even richer. There is a crisis of European competitiveness, as other nations across the world soar ahead. HD: We want to cut your wages so we can maintain our profits, because China and India pay slave wages! There is a gap between the EU and its citizens which has grown dramatically in recent years..
HD: We really, really don’t like that pesky European Court of Human Rights or the Working Time Directive! This is the competitiveness challenge – and much of our weakness in meeting it is self-inflicted. HD: If you people keep insisting on decent pay and a social safety net, how can we make money?! 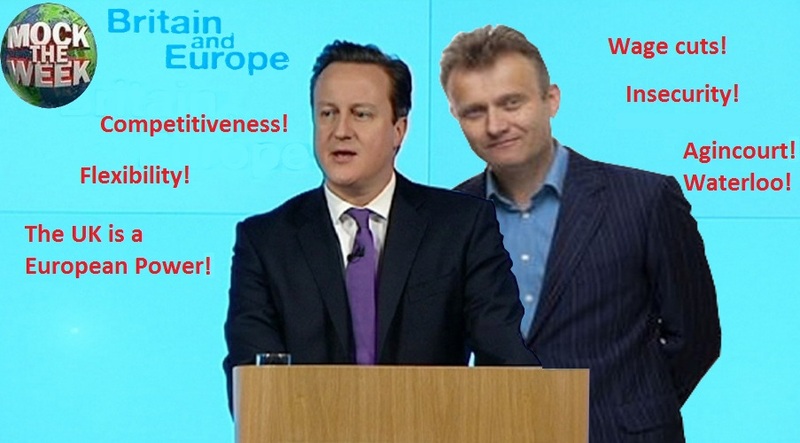 HD: We really, REALLY don’t like that pesky ECHR and those damned regulations about pay and employment protection! HD: Damn you, you ECHR judges and you bleeding heart liberal pinko EU bastards and your stupid rules – you’re slowing down our race to the bottom! If Europe today accounts for just over 7 per cent of the world’s population, produces around 25 per cent of global GDP and has to finance 50 per cent of global social spending, then it’s obvious that it will have to work very hard to maintain its prosperity and way of life. HD: All those poor countries save money by letting people live in slums, and dammit, it’s just not fair! We will cut everything to fatten our profits – your misery is a small price to pay! People are increasingly frustrated that decisions taken further and further away from them mean their living standards are slashed through enforced austerity..
HD: Enforcing austerity is for US to do – not for Johnny Foreigner! HD: Yes, of course we are distracting you from what’s really going on by stoking anti-EU resentment! [My vision] is built on five principles. The first: competitiveness. HD: It’s really, REALLY important for our plans that we be allowed to keep cutting your wages and protections! HD: In the race to the bottom, there’s no spare cash for looking after the sick, disabled or unemployed – or for the damned ECHR that might try to make us! HD: We really, REALLY hate the ECHR and those EU regulations – we WILL cut your wages and sack you just like they do in China, and fire you ‘at will’ just like they do in the US! HD: I’ve told you – we REALLY hate it! We cannot harmonise everything. For example, it is neither right nor necessary to claim that the integrity of the single market, or full membership of the European Union requires the working hours of British hospital doctors to be set in Brussels irrespective of the views of British parliamentarians and practitioners. HD: As well as paying you less, we want to be able to make you work longer, and the ECHR won’t bloody let us! We understand and respect the right of others to maintain their commitment to this goal. HD: As long as we’re not bound by all those pesky human rights and employment laws! We need to examine whether the balance is right in so many areas where the European Union has legislated including on the environment, social affairs and crime. HD: We really, really, REALLY hate that bloody court and those bloody laws! Why shouldn’t we be free to pollute, exploit, starve and imprison anyone we feel like?! HD: You get the picture! Yadda yadda..
Don’t forget the big picture – we’re doing this to get rich no matter what the consequences for the little people. HD: Don’t forget the big picture – we’re doing this to get rich no matter what the consequences for the little people. Hilarious Hugh Dennis saying what we suspect but in his hilarious fashion!!! For a bit of light-entertainment (it is not really funny) here is someone’s interpretation of Cameron’s nonsense rantings, worse Blair’s (the war-criminal) ever was. It is funny how the right and left in this country both vilify the EU, even if it were not for the EU, we would have USA labour relations and certainty no environmental protection.